If you have been thinking about taking the kids out kayaking with you, you have probably started looking into kids’ kayaks. Just like adult kayaks, you will run across so many choices it can be hard to know what the best kayak for kids is. When choosing the best kayak for kids you need to understand the difference between adult and kid kayaks, as well as what features are the most important. What Age Can a Child Kayak? Children of any age can enjoy kayaking but should be at least 7 before you put them in their own boat. One of the greatest things about kayaking is it is something you can do with the entire family, from infants up to adults. Younger children can ride tandem with experienced kayakers, as well as older and inexperienced children. Once children reach between the ages of seven to ten years old you can begin to teach them how to kayak on their own with a kid’s kayak. 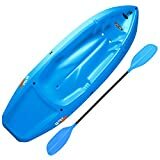 Is it Safe to Kayak with Toddler? Can two People use a Kayak for one Person? Which is Safer Canoe or Kayak? 1. Is it Safe to Kayak with Kids? 2. Where can I Kayak with Kids? 3. Does my Kid need to wear a Life Vest? 4. Should my Kid Ride in their own Kayak? 5. How old should my Kid be to Learn how to Kayak? The most important things to keep in mind when purchasing the best kayak for kids is weight rating, length, width, sit on top, ability to add a tow rope, stability features, paddle holders, and adjustable foot braces. One of the greatest things about kayaking for kids is that it lets them have fun and explore on the open water, all while building up their physical strength. Another benefit to kids who kayak is they become better problem solvers, as they often have to figure out solutions to problems while out on the open water. Perhaps the biggest benefit of all though is kayaking helps make your kid more persistent. Give them something they do not enjoy doing, but have fun doing the harder they will work to master it and not give up. Weight rating is the most important factor when choosing the best kayak for kids as they are sized based on weight. 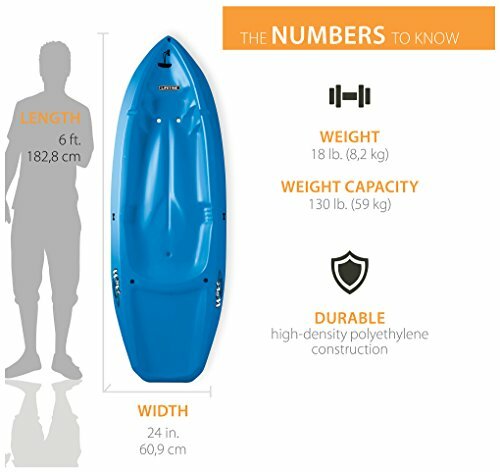 Each manufacturer will include a weight range for each of their kayaks that you will need to consider. Children that are lighter than the recommended minimum weight requirement will need to find a smaller kayak or wait until they grow into the one you are purchasing. If your children are heavier than the maximum weight limit you must purchase a larger kids kayak or even a full-sized adult kayak. Most kids will be kayaking on slow rivers or flat, open, calm waters so there is no big concern about specialized types of kayaks being used. Majority of kids’ kayaks are going to be short, which the shorter kayaks are the easiest for kids to control. The shorter boats are easier to transport and move, plus they are lighter and turn easier than the longer ones. Most kids’ kayaks come in one length, so you will want to consider the other features when choosing the best one. The width of the boat plays a big role in choosing the best kayak for kids. One of the most important roles it plays in the stability of the kayak. The wider kayaks are often more stable and have a lower risk of flipping. Although they are less efficient than narrower kayaks, the stability the wider kayaks provide is vital for your kid’s safety and ability to learn how to paddle. Along with width, pay attention to the hull you need a double hull or a pontoon style hull. The best kayak for kids is going to be a sit on top style. The reason for this is this style of kayak is simple to get in and out of, plus they are durable enough for kids. The sit on top style is made from a single piece of molded plastic, so they can withstand beginner mistakes. Sit on top styles are more stable, so there is less chance of your kid flipping the kayak. If they do, sit on tops offer self-draining holes so no worry about water building up inside the boat. While sit on top is the most common style, you can find a handful of sit-ins made for kids. Many kid kayaks come with this feature and it is an important one to have. You want to look for a kayak that gives you the ability to attach a tow rope. This will allow you to tow your child behind your kayak if they grow tired of paddling. Tow ropes are also necessary for being able to rescue your kid if they become stuck in the brush or on a river bank. You want to be able to permanently tie about 20 feet of rope to the kayak. Stability is important when it comes to kids kayaks. Along with the width and hull, there are a few other features to look for that will improve stability. For kids kayaks, you want to look for reverse chines, which are fins that jut out from the kayak and aid to stability as well as tracking. Other features to consider are fins and skegs as they improve stability and tracking. This isn’t a huge deciding factor, but if you have to tow your kids you do want somewhere for them to store their paddles. Most paddle holders are simply depressions in the plastic body with a shock cord attached in a way to fit over the paddle. You know how fast your kid grows and the last thing you want is to have to buy them a new kayak each year. One way to ensure the kayak lasts longer than a year is to purchase one with adjustable foot braces. If you can’t find one you like with adjustable foot braces, you can also look for the molded foot braces with a variety of options. Kids sit in kayaks are not as popular of a choice as a sit on top model, but they can be found if that is the style you prefer. Kids sit in kayaks are available, just as sit in kayaks are available for adults. Although this style of kayak is available for purchase it is not the recommended style of kayak for kids. Most kids begin kayaking in their own boat between the ages of seven and ten years old. When they first start kayaking, despite maybe growing up on the water in a parent’s kayak, they are still new and inexperienced paddlers. With that in mind, they need something a bit more stable to learn in. Sit in kayaks do provide some advantages, such as keeping you dry and allowing paddlers to sit closer to the water for easier paddling. 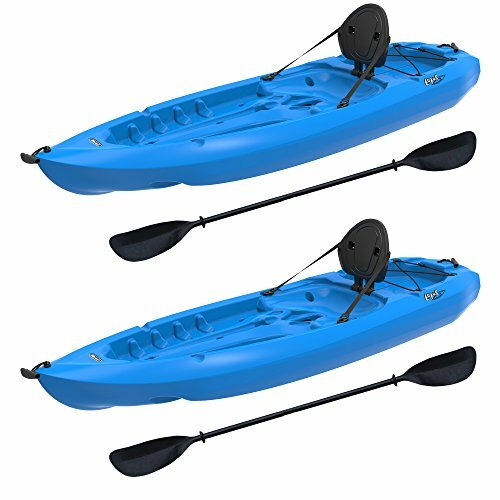 Although these things are nice for new paddlers you really need to focus on stability and sit in kayaks do not offer much in terms of stability. One of the best sit in style kayaks for kids is the Old Town Heron Junior. 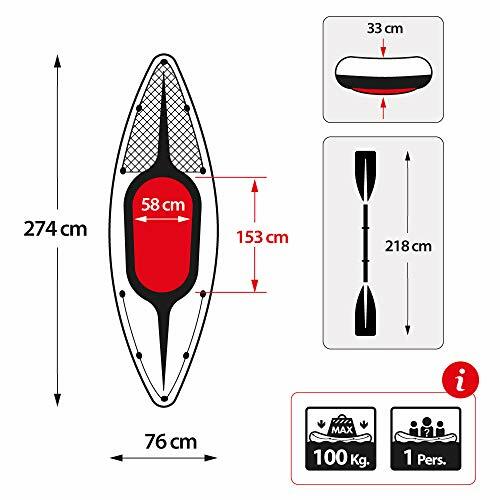 The wider width of this sit-in kayak adds to its stability, plus the internal foam billets prevent the boat from sinking if it does capsize. When it comes to the best kayak for kids you want to opt for kids to sit on top kayak for safety and stability. If you have kids that are interested in trying out kayaking you want to set them up with the best kids kayak. Sit on top kayaks are one of the best choices for kids kayaks because they are simple and durable. 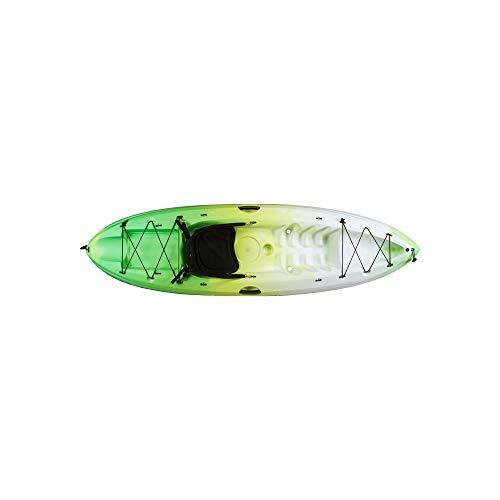 Sit on top kayaks are manufactured from molded plastic in one piece, they are not put together so you have no pieces or seams to worry about. As the name suggests with these kids kayaks the seat is found on top of the kayak. This location is ideal for kids as it makes it simple to get in and out of. The other benefit to a sit on top style kids’ kayak is the stability they offer. Most kids are inexperienced kayakers, so they are just learning how to paddle boats on their own in the open water. Stability is important for beginners because the last thing you want them to do is flip over. Even if these kayaks flip you will never have to worry about water building up inside the kayak, as sit on tops offer self-draining holes. If your kid does flip, they just need to right the boat, get back in and paddle off. When picking out your kids fishing kayak you want to pick out the most basic design you can find. If you are an avid kayak fisherman you probably can’t wait to share your passion with your kids. The good news is that just like adult fishing kayaks, they also make kids fishing kayaks. These kayaks are built specifically for kids but offer the same benefits that a fishing kayak offers for adults. Just like an adult fishing kayak, you want to carefully select your kid’s kayak to ensure you are getting what you need. Tandem fishing kayaks will work best at the beginning for kids. 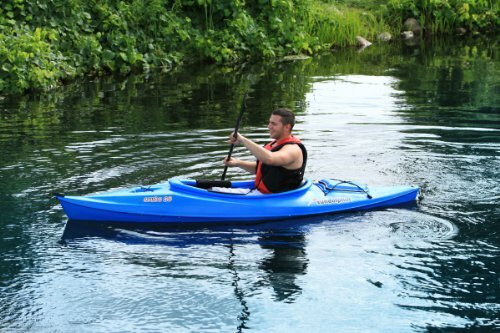 This allows them to enjoy the experience without worrying about the finer aspects of kayaking. As they get older and more experienced you can move them into their own fishing kayak. Most kids around the age of 10 will do fine in a kayak on their own. But when you make the switch will depend on how comfortable they feel in the kayak and with kayaking in general. The best kids fishing kayak is going to be the most basic as well, the less they have to worry about the better they will enjoy it. If you know what you are doing it is perfectly safe to kayak with a toddler. One of the greatest things about kayaking is it is something that you can share with the entire family. Kayaking doesn’t require a lot of physical strength, so it is something that children can participate in. 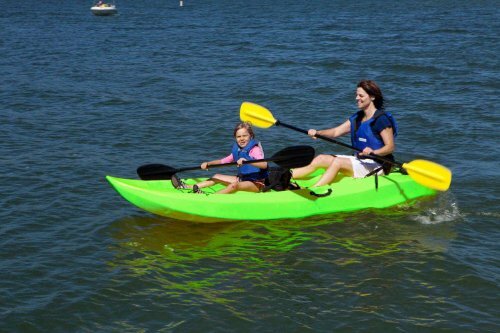 Infants and toddlers can easily ride in the front of the kayak with their parents. When kayaking with a toddler, make sure they have a properly fitted life jacket and that they are wearing it at all times. Parents should also be experienced kayakers and always think about where you will be paddling when having toddlers ride with you. Purchasing a separate child seat that can be installed on a single kayak is another option parents might consider. If you are not ready for your child to start kayaking in their own boat you have a few different options. 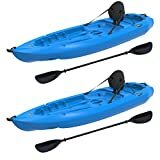 One option is to purchase a tandem kayak, which is made to accommodate two adults. A second option is to open your storage compartment or hatch in the bow of the boat and allow your child to ride in there. The best option and probably the most cost-effective option is to use a single kayak with a child seat. The child seat is not something that can be used with all single kayaks, so look into your exact make and model before deciding on using this option. How this method works is you purchase a separate child seat that can be installed as needed on a single kayak. This gives you the ability to take your young child out on calm waters with you, but can also be taken off so you can use your single kayak on longer trips without your child. Two people cannot safely use a kayak made for a single person. The short and sweet answer to this question is that no; two people cannot use a kayak designed for one person. The reason behind this is that it is not safe. Kayaks are designed specifically to carry their loads in certain places. Single person kayaks are designed to carry the majority of the load in the center of the kayak, so putting a second person on the bow will slow the kayak down. Plus with how close you will be sitting next to one another paddling becomes impossible. Experts on both of these sports agree that a canoe and a kayak are equally safe. One of the greatest things about a canoe and a kayak is both sports offer paddlers the chance to exercise while enjoying the water. Even better is that experts of both sports agree that they are equally safe. A canoe is no safer than a kayak and vice versa. The biggest difference between the two sports is how paddlers sit. In a kayak, paddlers don’t sit on the floor of the boat and they extend their legs straight out in front of them. In a canoe, paddlers do sit on the floor of the boat, but their legs are bent at the knee. Here are the answers to some of the most commonly asked questions about kids’ kayaks. Where you go kayaking with kids will depend on how skilled your kid is. Younger children or those just getting started with kayaking should stick to calm waters, such as small lakes or even ponds. As they get older and more experienced you can move to different kinds of waters, but stay away from anything with strong currents. Everybody who is kayaking needs to wear a life vest or a PFD. Even on calm waters, things can go wrong, so you need to make sure you are taking the proper safety precautions. You might not think you need a life vest, but you should still wear one so you can always be safe on the water as well. Kids under the age of 10 are best off riding tandem with adults. If riding tandem they should always be in the front, as the person in back steers. Sit on top kayaks can fit two adults with a small child in the middle. Kids between the ages of 4 to 7 years old can ride tandem or sit on the bow of the kayak for short trips. Kids ranging from 7 to 10 years old are the perfect age to start kayaking in their own boat. Kayaking is a great sport not just for adults but for kids as well. Whether they’re just starting out or they’re confident enough in their skills to go kayaking on their own, a kayak that ensures the safety of your kids is a must. You want a kayak that is stable and that your child won’t outgrow too quickly. Depending on good your child is at kayaking already, you can also look at simple kayaks for kids, kayaks which are capable of doing solo trips, or even tandem kayaks to teach your kid the basics and go rowing together. No matter what your preference, this list will have something for your needs. It is compiled by popularity and ratings and also gives you a breakdown of why each kayak is a good choice for kids. This kayak by Lifetime, is one of the best kayaks for kids out there. It gives you both stability and safety, which are the most important considerations, at a very reasonable price. It also comes with a paddle. This means that you can start your child off on this kayak without spending too much and worrying about them outgrowing it and having to pay for a new one again. It is recommended for ages 5 and above and has a weight limit of 120lbs. It has multiple footrest positions for children of all sizes and ages. It is extremely wide and made of a durable and UV-resistant high-density polyethylene to ensure maximum stability and minimize the chances of damage. It even has a reversed chine for better stability. It is a great kayak for teaching kids wet entries as well because it has a sloped back end as well as a swim-up step. 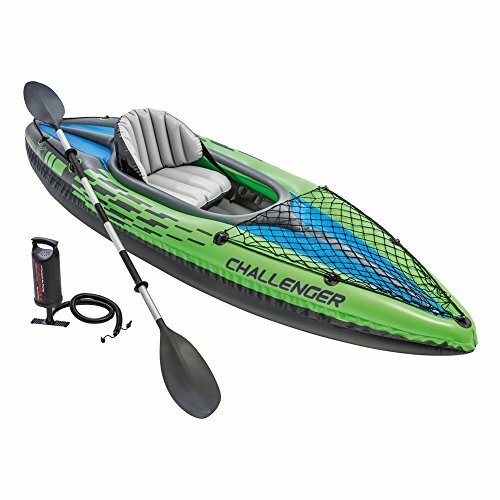 The Challenger K1 is one of the most popular kayaks around, with around 2000 reviews. It’s an affordable kayak for older kids or teenagers who might just be starting out. It is quite spacious and its streamlined design makes for easy paddling. It is made for very durable vinyl which makes sure that it is safe and resistant to punctures. The inflatable I-Beam floor for rigidity so that it doesn’t flex or bend in the center. It even has grab lines on both ends for safety and easy carrying. 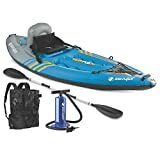 It deflates and inflates easily and even comes with a hand pump and an aluminum paddle, which makes it a real value-for-money buy. It is light enough for kids to carry on their own. It is also very convenient to store so in case your kids don’t use it too often it won’t be taking up space in your home. The kayak can even suit the needs of more experienced kids. In case they want to go kayaking on their own, it has a cargo net for them to store all the gear they’ll need. It has a weight limit of 220lbs so even adults can take it out on the water. 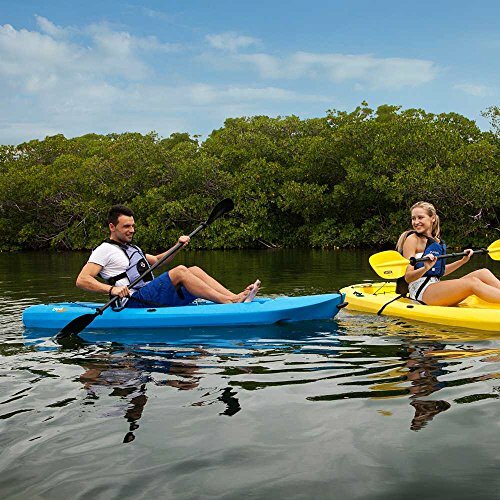 The Sundolphin Aruba 10 is a compact hard-shell kayak for those kids who are just starting out learning and need safety and stability as well as those who want a bit of independence to go exploring on their own. 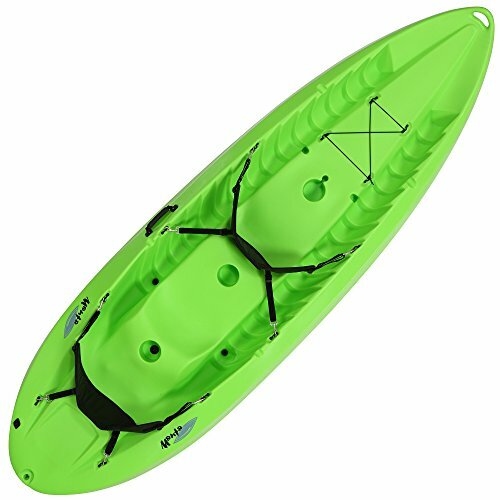 It has a large, open cockpit that’ll fit children of all ages and has adjustable foot braces so that your kids don’t outgrow the kayak. It is made of rugged, high-density polyethylene which ensures that it doesn’t get damaged easily. It also has a good amount of storage space in the front along with shock cord rigging to store equipment for when your kids are kayaking on their own. It also has a convenient bottle holder. Carrying handles on the front and back make it easy to transport and with a weight of 40lbs older children will be able to lift it up on their own. 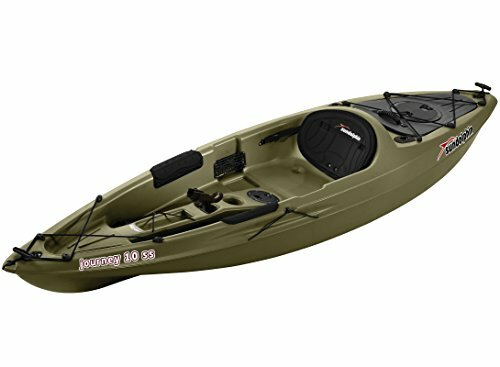 The second Lifetime kayak on this list isn’t the most popular as some of the others but remains really well-rated. This is a great option for families with 2 children because they come at a discounted rate when you buy 2 together. A paddle also comes with your purchase. It is a compact, 8-foot long hard-shell kayak that has a weight limit of 250lbs so even adults can get into it. The sit-on-top design is great for kids just learning how to board kayaks. It is made of UV-resistant high-density polyethylene which is extremely durable so that it doesn’t crack or leak and cause safety issues. The hull is designed with the aim of maximizing stability so that it doesn’t flip over while also improving its tracking. For children who want to go out on their own, it has tank well storage as well as bungee chords to stow away cargo and gear respectively. Other features include an adjustable quick release seat back as well as multiple footrest positions so that your kayak can grow with your kid. 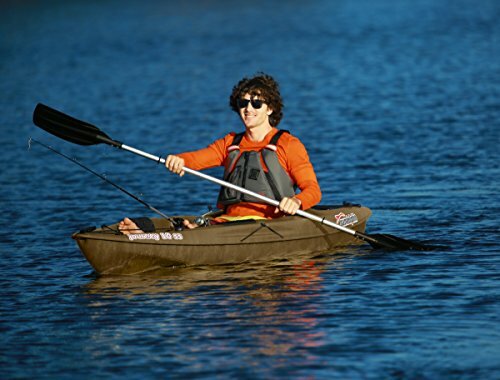 Like the other kayaks on this list, Ocean Kayak’s Frenzy is geared towards maximum stability. It is unique on this list since it is meant for use in saltwater and is a great introductory saltwater kayak for kids. Its Tri-Form hull is designed to combine primary stability, which refers to the stability of the kayak on flat water, with secondary stability, which is its ability to not flip over when tilted. This is an important safety feature for kids. In addition, its elongated center keel is designed for straight tracking so that you don’t have to put in too much effort to get to move in the direction you want. It also has molded foot wells that can fit children of different heights so your kid won’t be outgrowing the Frenzy in a hurry. For storage, it comes with a tank well as well as bungee cords so that you can store both cargo and equipment. It also has a nifty cup holder molded in. It comes with Ocean Kayak’s Comfort Plus seat that fits into the molded-in seat well. Side carrying handles and bow/stern toggle handles are also present to make it easy to carry and a screw-in drain plug makes drying it out easily after a day on the water. It has quite a high weight capacity of 325lbs. 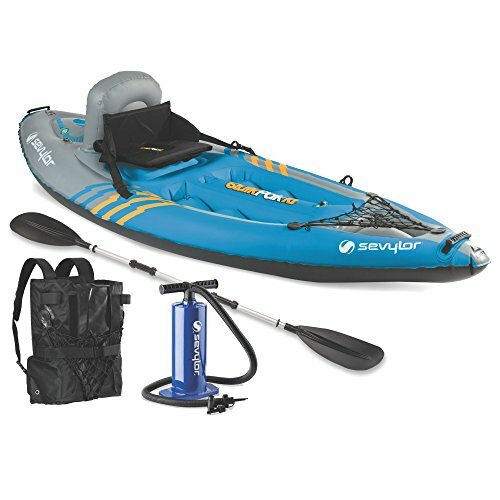 The Sevylor Quikpak K1 is great for kids who want to go kayaking on their own. It is quite compact and light and folds into an easy-to-carry backpack system so they can carry it down to a lake on their own. It can also be set up in 5 minutes with the hand-pump that is provided with it. It also comes with its own paddle. The bottle holder, as well as the bungee storage area in front, allow kids to carry their own items and gear when they are on the water on their own. For safety, it is made of a 21-gauge PVC for rugged use with a tarpaulin bottom that is meant to be puncture-resistant. In the off-chance that you do get a puncture, it will only deflate one of the multiple air chambers in the Quikpak K1. This will let you get to the shore safely with the remaining inflated chambers. It is also designed to be comfortable for children of all ages since it has an adjustable backrest that can recline along with multiple footrests. 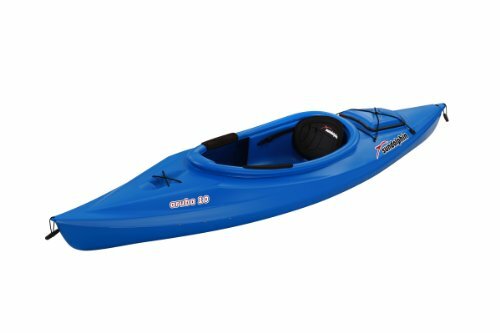 The Lifetime Manta 100 is a great option for families who want to get their kids into kayaking. It has a high weight limit of 500lbs and is meant for tandem kayaking so you can take your kid onto the water with you to teach them. In case you have a very young child, there is even a space in the center for a third person. The design itself is meant to be ultra-stable through a specially shaped hull along with a broad body. It is made of UV-protected low-density polyethylene and has multiple footrest positions to make it comfortable for all members of the family. It even comes with two padded backrests. It is easy to carry and transport for a family and it has ditty trays and shock cords to stash away equipment and gear. Another convenient feature is the self-bailing scupper holes which make the Quikpak K1 easy to drain while drying it out. The final kayak on this list is one that is suited for kids / teenagers. Unlike the other kayaks on this list, this isn’t a recreational kayak but is, instead, a fishing kayak although it can easily be used for recreational purposes. This multipurpose usage makes it great for teens who want to start exploring more kinds of kayaking or have started to develop an interest in fishing. It even has multiple footrests so that it can be usable by your kids even through teenage growth spurts. The open cockpit design allows for an easy entry into the vessel. Its rugged UV-stabilized high-density polyethylene is meant to keep it extremely durable so that it can reach the most out-of-way fishing spots. It is also has a lot of stability, which is a quality that many fishing kayaks often lack. The features that make it great for fishing include one swivel and two flush mount rod holders and recessed tackle holders. It also has a lot of storage space for kids to carry their own gear. The storage includes a unique portable accessory carrier that is a removable form of extra s storage along with a regular storage compartment, shock cord deck rigging for gear, ditty trays, a paddle holder and a beverage holder. It has a maximum weight capacity of 250lbs. Kayaking isn’t just a solo activity but can be turned into a great recreational family sport as well. The kayaks on this list are suitable for all kids, whether they are just starting out or already know the basics, and ensure stability, safety, and satisfaction. One of the greatest things about kids kayaks is there are so many options to choose from. With all of the choices, you can always find something that will work perfectly for your child despite their age or experience. Aside from all of the things we have talked about, you will also want to consider your child’s age and how interested they are in kayaking before making your choice on the best kayak for kids.